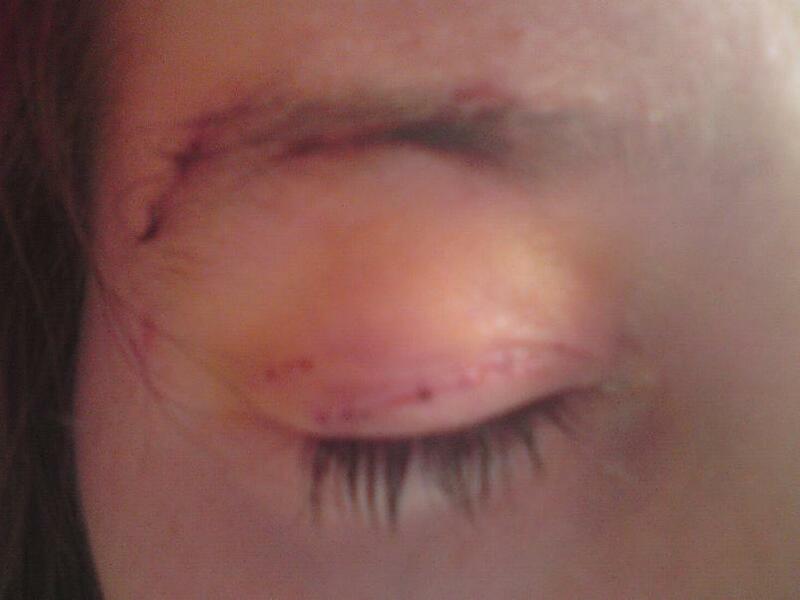 My eyebrow op has gone well, any bruisnig or swelling i had went down quite quickly which I was surprised with! My eye seems more open that my other but I still think it could be more open and just over the pupil but my doc can adjust that by 1mm if needs be in the next operation in November. Im quite pleased with it. I still have a stitch in my head but the ones on the eyelid have dissolved. I have had no double vision since! I had a bit of trying to look at things more closely after the first few days but that has now settled. i was surprised at how I didnt really have much pain and any pain i had was helped by paracetamol. My eyebrow was frozen for about a week and a half so my eyebrow woudlnt move if i tried and it was lower that my other one but its all gone back to normal now. The stye eye that was drained is still a little bruised but i can tell the difference between how open my other eye is now. im very pleased with it and hope the other op in november goes well too! I woke this monring dreading this! Id been up most of the night what with my feed going all over my bloody bed again! Mum called today for tubes that have no medicene port and just a port where i connect to my feed because the feed going all over my bed has happened too many times before! and i cant sleep in it! So from what the nutritian centre said that they should be able to send some one port tubes! WOO HOO! no more feed over my bed! Back to my stye! i got up at 8am having been awake most of the night sleeping on a towel, and went off to the local hospital to have the stye drained. The stye has to be drained because with the next upcoming brow suspension op, i need to be rid of it by then. If i still had the stye, the doc wouldnt do the operation because f risk of infection so it would have been a wasted journey! So we told the nurse this stye needs to come out ASAP! she said there was a waiting list for it though AFTER the op which was no good!!! Then a senior nurse came in and said “I can do now it uf want” we took her up on it because we wanted it out as early as poss so it can heal. She sat e down in a dentist like chair and put a local in my eyelid which stung and pretty much made my eyelid trickle with blood… she then put some kinda clamp on my eyelid to turn it inside out which was painfully uncomfortable!!! it felt like it was squeezing my eyeball!! 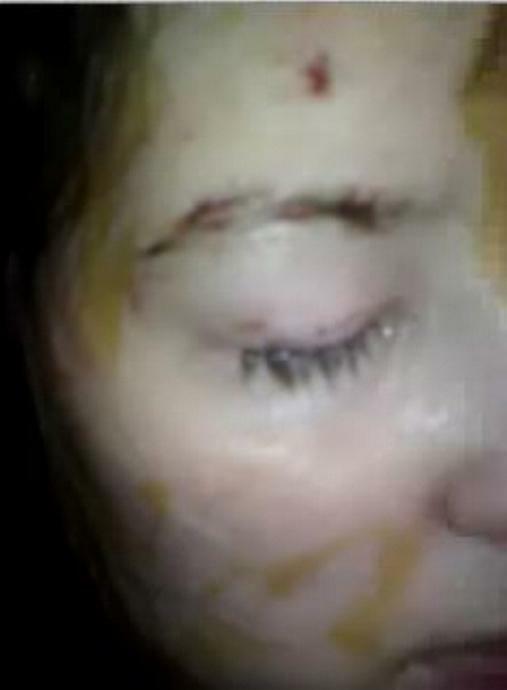 she drained the cyst (stye) out and put a bandage on it. after a check up on it after 5 mins and a new bandage to take off after 2 hrs, i was free to go home. By the time i got home and 2 hrs later, i took the bandage off and it was sooooo bruised and swollen it;s unbeleivable! i couldnt even open it for some time! Hopefully it will heal in time for the opteration in November. 🙂 For now i have to put antibiotic drops in for 4 days and see how it goes! Wish me luck! 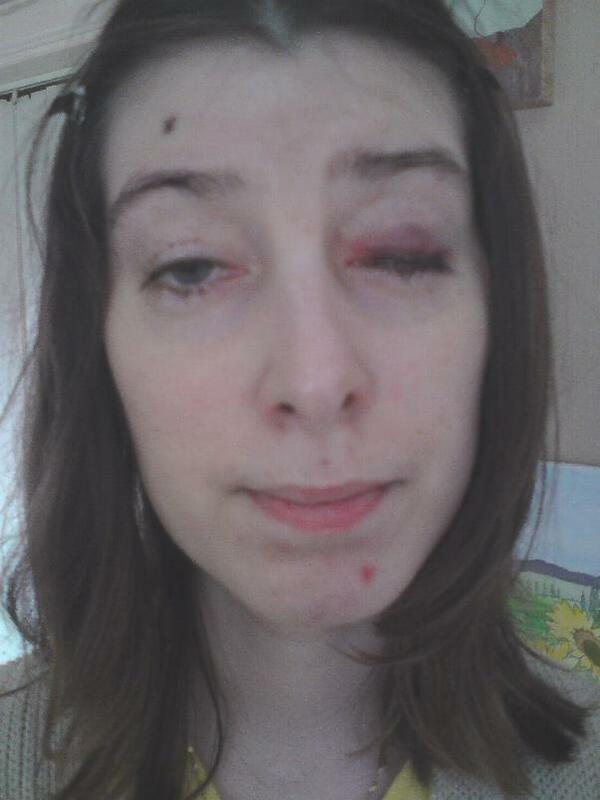 11th oct- my eyelid has swelled up a bit and theres a bit of bruising. it feels a bit stiff to blink but its ok and no pain. My parents say they can see a difference between my right aye and my left eye. 9th oct– My parents arrived just in time for the unveiling of my eyelid. The doc came about 10am and told us what to expect. 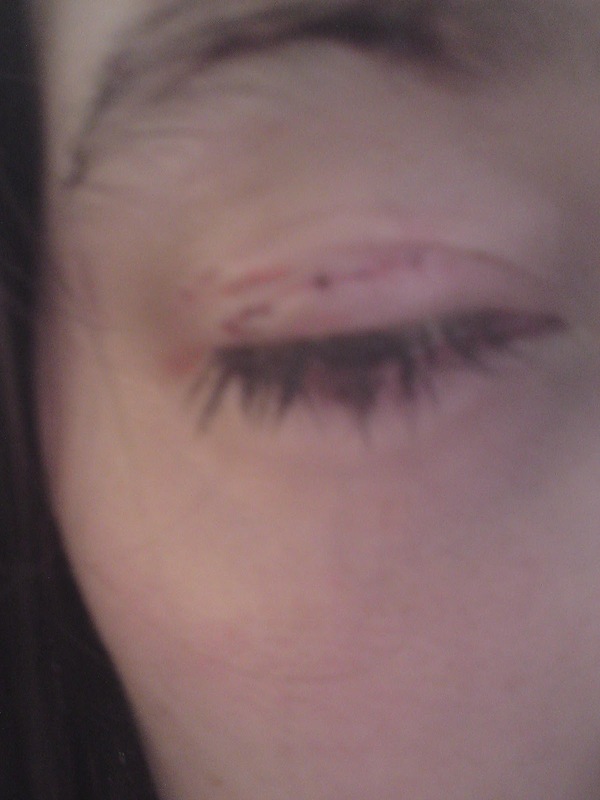 he took off the patch and i had 3 stiches on my eyelid 2 on my eyebrow and one on my forehead. The doc said it looked good and that he was confident. He told us it would take a few days for the local to wear off and maybe a few weeks to see the final outcome. he also told us that they were disolvable stiches so i didnt have to have them taken out which i was pleased about because they were in a deleicate place. it felt a bit weird and a bit sore so i took some parecetamol and chilled out for a bit while the nurse came to clean up my face a bit because of the icky theatre antiseptic. She then left to get our discharge papers and give us some drops to put in my eye for a week. 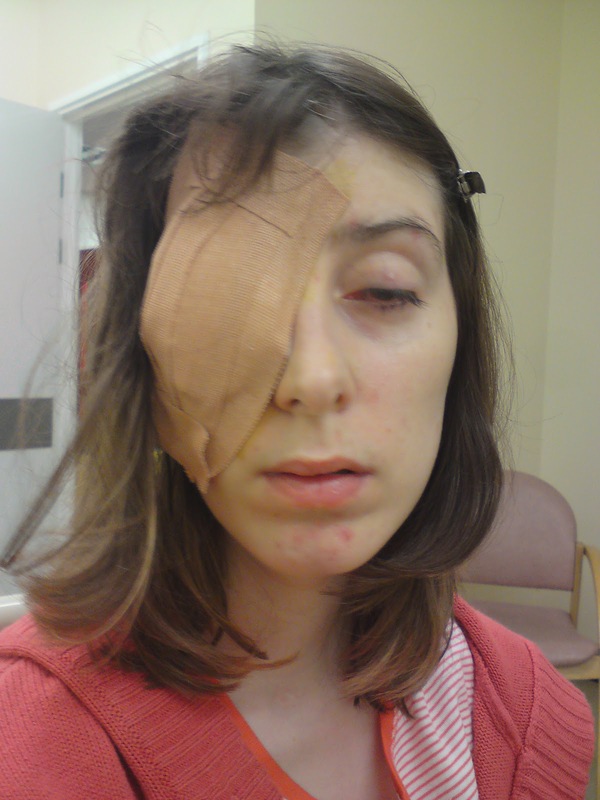 10th oct- 2nd pic – my eye was looking better but the doc said the swelling would come over the next few days. My eyebrow is still low from the local. 7 oct – We set off to Newcastle about 11am from home and I wasnt really worried about the op We got there for our appointment at 1pm with our eye doc who said that he would be doing my right eye instead of my left one because the left eye had a stye cyst on it and he didnt want to risk infection. We then went off to a different ward and went to see Victoria, who was one of Doc Turnbulls docs but she was running late so we were in the waiting room as always but before she came I had my PEG button changed as it was time for my 3 month change . Once she came up we went to a room, she checked out the usual stuff like the reflexes and and the usual questions that i have every year such as “how is your swallowing and feeding doing?” just my general wellbeing. She seemed a bit concerned about my right leg as when she did the reflexes my right foot was little weak and she wated to know if i wore a splint in bed which i never have. My parents were asked the same question when I was in ICU in 2007 as my feet tend to flop forward rather than stay upwards when i lye down. Victoria gave me some exercises to do with my feet when i can. After that we were free to go back to the hotel! i had an awful night and couldnt seem to drop off much to the annoyance of my parents. 8 oct -Just as well because I had to be at the hospital again at for 8am!! The roads were deserted which was nice and we could get there quick!! once we were there, we had to go to ward 21, but we had to go to this eye outpatients ward first and get checked in and given my hosptial band as i was also staying the night as we had travelled 3hrs to get there and the doc had to check my eye the next day. They also asked the usual hospital Questions like a pre op thing. 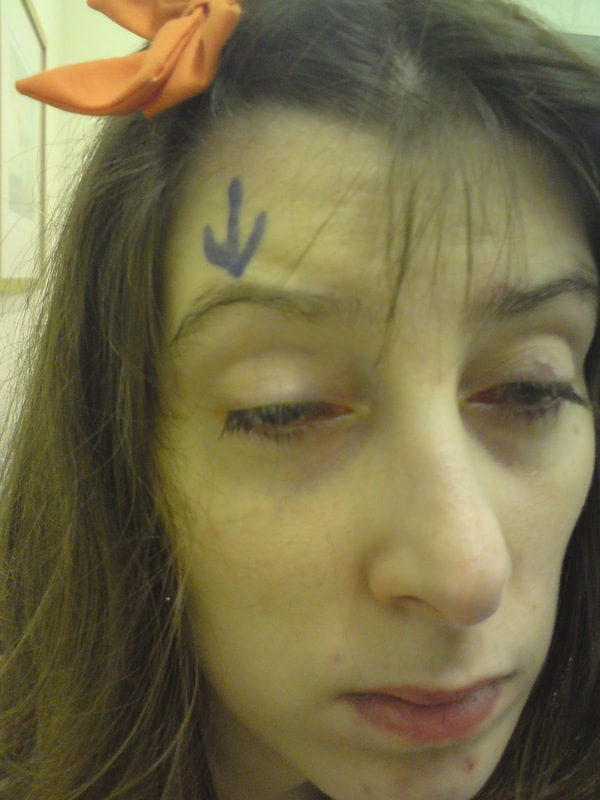 The nurse plopped an arrow on my right eye with an arrow to make sure they have the right eye and then because i was worried about feling the locals, they stuck some numbing cream on me It seemed like we were there for hours before I was finaly called for my op. I was a bit terrified but glad i was half asleep to be honest due to the bad night. They took me down to threatre about 3pm and dad came down to the theatre to hold my hand while the docs put the locals in. It was really weird because i had my cochlear implant in as they said i could and my sound went really weird like i was drugged up and in a bubble but i could still talk to the doc while he perfromed the op. The locals froze the eyelid and the eyebrow and into theatre i went. i was glad i could hold one of the nurses hands i felt that helped and the doc talking about my hamster Nev! i felt at ease and relaxed. There were periods which i didnt like because he put a cloth over my other eye as he worked on the right. im so glad i had my cochlear implant on other wise i would have freaked out a bit! and im glad i could hear them talk! After 45 mins in theatre I was wheeled out in a wheelchair to where my mum and dad were waiting outside.The bandage was packed on tight to keep the eyelid in place and it didnt hurt much unlesss i moved the muscles around my eyebrow. I was then wheeled back to the outpatients again as we were still waiting to go in our room on the ward. I was pretty tired so i really couldnt be bothered at the time I think that helped! !